Whether it’s to perk up a midweek lull, or be your night out on a Friday after work, watching stand-up comedy is one of our favourite ways to spend an evening. But making sure you’re in the right place for watching the right kind of comedy for you. We’ve gathered a list of our favourite rooms, comedy nights and venues that take place across the UK, and we hope they’ll be your favourites too. Bristol has long been a thriving hotbed of new comedy talent. Last year’s Edinburgh Award joint winner John Robins started out on the Bristol comedy scene, as did 8 Out of 10 Cats star Jon Richardson. The Tobacco Factory is the perfect place not only to spot the next Robins and Richardson but also to see some of the best stand-up that the country has to offer in an intimate theatre space. As well as hosting tour shows from acts such as Tiff Stevenson and Rachel Parris, The Tobacco Factory also has mixed bill nights with star headliners from Nish Kumar to Elf Lyons. Over the 10 years it’s been open, it’s built up a reputation as a prestigious, incredibly well attended venue with a lot of care put into its programming. 2018 will see the theatre invest money into new studios, and backstage and front of house refurbishments, so there’s an even more exciting future to come. Located downstairs at the Jericho café, Tight Five is one of the more alternative nights in Oxford, with all ticket sales going directly to the charity MIND. Usually taking place on Saturday nights, Jericho Comedy has seen acts such as John Bishop, Tony Law and John Oliver grace it’s stage. The venue also runs a series of other nights, such as ‘Stand-Up History’ and ‘Mock Trial’ which have had successful runs at the Edinburgh Fringe and gone on to have national tours. Since 2016, the Saturday night shows have consistently sold out so booking is definitely recommended for this intimate and exciting performance space. Tight Five can be found in Jericho Café, 112 Walton Street, Oxford, OX2 6AJ. Edinburgh is the hub for stand-up during the Fringe every August, but that doesn’t mean it’s barren the rest of the year. The Stand is a favourite of many a comic, and as well as Edinburgh they also have venues in Glasgow and Newcastle. With Thursday, Friday and Saturday shows as well as tours and one off charity gigs, The Stand is a purpose built basement comedy club that is not just a hit during the Fringe, but the whole year round. And if you fancy yourself as a laughter maker, anyone can apply to perform at Red Raw, which takes place every week and is widely considered one of the best open mics in the UK. The Stand in Edinburgh can be found at 5 York Place, Edinburgh, EH1 3EB. 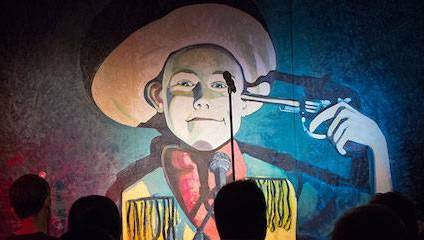 A 10-year-old comedy club which provides Manchester with a series of monthly gigs around the city, Trapdoor Comedy not only books some of the country’s most exciting new acts but it delivers them to you affordably. With most of their shows only £5 a ticket, it’s hard to find a reason not to grace the Old Pint Pot Show or Solomons every night of the week. The Old Monkey, which has been running since 2014, is their biggest gig and hosts the bigger names that Trapdoor get, from Sara Pascoe to Bobby Mair. Comedy venues that understand their audience and their acts can be hard to come by, but these nights are each perfectly crafted to the space. Trapdoor Comedy takes place across The Old Monkey, Old Pint Pot, and Solomons and more information on these gigs can be found here. With gigs held at Soho Theatre in London as well as the Komedia in Brighton and G Live in Guildford, Comedy Club 4 Kids is the country’s premier comedy gig for your little ones. Professional stand-ups from the circuit swap pub rooms and the smell of beer for an audience full of children and their parents, giggling away at the acts’ material made suitable for little ones. It’s not only fun to see how the circuit’s best comedians manage this, but also gives children the chance to see some of the best stand ups that the country has to offer before they’ve even hit their teenage years. Tiernan Douieb is the resident MC and the company also offer workshops for those youngsters that get the stand-up bug from their seat in the audience. Comedy Club 4 Kids can be found at Soho Theatre, 21 Dean Street, London, W1D 3NE, as well as G Live Guildford and Komedia Brighton.